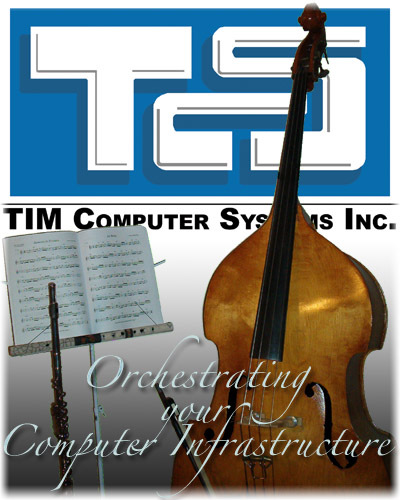 For over 15 Years, TIM Computer Systems, Inc. has been providing high quality service, maintenance and consulting for the IT Departments of Government Agencies, small to large Corporations and Education throughout the New York / New England region. The TCS staff of engineers have many years of experience in a wide variety of technologies and business systems. TCS is always evaluating new technologies that solve our customers business needs. But what really sets TCS apart from our competition is our People First solution to IT. TCS understands that every business is different, each with their own personality and needs. TCS acknowledges the different business needs of our customers and works with them to find an IT solution that will fit their business, make them more productive and provide them with the lowest Total Cost of Ownership. TCS provides you with custom solutions that meets your needs and is the "Right Fit" for your business. Thus your business does not pay for features that you will never use. This allows for the highest quality solution for the lowest cost. Thank you for your interest in TIM Computer Systems, Inc. and we hope that we can be of service to you in the future.